I’ve noticed a bit of a new trend this year and that is designer eclairs. If you picture an eclair as just a cream filled choux pastry topped with milk chocolate icing, you may be surprised to discover that there are numerous new variations of the dessert hitting the market. You can always rely on Marks and Spencer to be on trend, and of course under their new Spirit of Summer range (I know it is only just May) they have these new posh Orange Eclairs. Even the packaging is super smart, they are sold individually in their own box, which is quite handy to keep them safe in when getting them home from the shop. The filling in the choux pastry is a light and fluffy orange cream, and it is topped with and orange flavoured white chocolate topping, and some posh decoration too. I think what struck me was just how orangey this was. The flavour from the filling packs a yummy refreshing citrus burst. The orange taste was strong, natural tasting and lovely and sweet. The white chocolate with orange icing was gentler in flavour, but all together the flavours were really nicely. 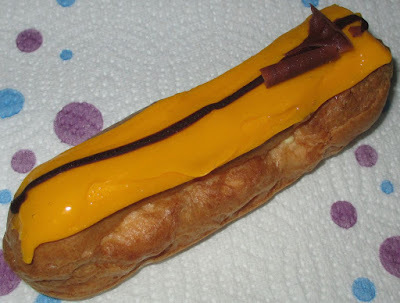 This is a very posh eclair and the tone of the orange was spot on, and very enjoyable to eat. I will keep my eye out for other designer eclairs and see how they compare, but if you are going to alter the flavours at all, then this orange version is going to prove hard to beat.